Kiawah Island is a barrier island and, as such, is particularly susceptible to damage from severe weather and natural disasters like hurricanes, floods, tornadoes, and earthquakes. Being prepared and informed is important. Sign up for the Town’s emergency notification system CodeRED. CodeRED is used to communicate to residents in emergency situations or critical community alerts. CodeRED is typically reserved for short evacuation related messages sent with only pertinent information. Sign up for the Town’s emergency email notification The Town’s Emergency Notifications email distribution list will send detailed notifications to your inbox during all emergency events. This list is not the same as CodeRED. Hurricanes are our most frequent disaster threat. When a storm develops over warm Atlantic waters and winds intensify, it can easily become a tropical depression, then a tropical storm, and finally when winds reach 74 mph a hurricane. Hurricane season is from June 1 to November 30. For our area, the greatest frequency of storms occurs from August 15 to October 15, with September being the most likely time for an occurrence. 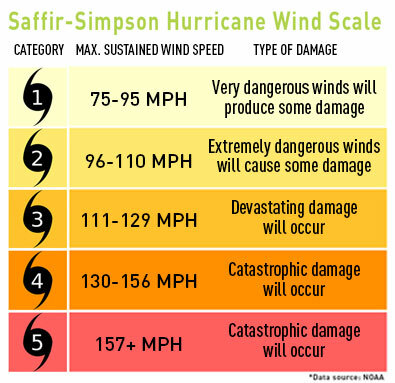 A hurricane’s intensity is measured by the Saffir-Simpson Scale. Storm surge will depend on coastal configurations and other factors. Hurricane Watch: A hurricane is possible within 36 hours. The Hurricane Center is tracking the storm and trying to predict where it may come ashore. Storm surge is often the greatest threat to life and property from a hurricane. Storm surge is an abnormal rise of water generated by a storm, over and above the predicted astronomical tide. It is produced by water being pushed toward the shore by the force of the winds moving cyclonically around the storm. There will be more flooding if the highest surge occurs around high a tide. The coastal areas of South Carolina are very surge-prone given the low elevation and gently sloping continental shelf offshore. Flooding on Kiawah Island may be caused by a number of naturally occurring events including hurricanes, wave washes, tidal surges, King Tides and tidal waves. Heavy rains over a short period can overwhelm existing drainage capabilities and prove disastrous at high tide. Tornados are defined as a violently rotating column of air extending from a thunderstorm to the ground. The most violent tornadoes are capable of tremendous destruction with wind speeds of 250 mph or more. Damage paths can be in excess of one mile wide and 50 miles long. Although most frequently associated with Texas and the southern High Plains, tornadoes can accompany tropical storms and hurricanes that move over land. Tornadoes most commonly occur in Charleston County from March to May. Waterspouts are weak tornadoes that form over warm water and are most common along the Gulf Coast and southeastern states. They have been known to move inland becoming tornadoes. The safest place to be during a tornado is underground, preferably under something sturdy. Since Kiawah homes do not have basements, a small room in the middle of the house – like a bathroom or a closet – is best. The more walls between you and the outside, the better. If possible, it is also recommended that you move to the center of the lowest level of your home, away from windows, and lie flat. If you are in your vehicle, seek a safe structure or lie down in a low area with your hands covering the back of your head and neck. Earthquakes are regular occurrence in South Carolina and the Palmetto State has a significant earthquake history. What may elude us is the numerous, almost monthly earthquake activity that frequents this area. No one knows whether these small quakes are a pre-cursor to the so called “Big One,” or if this seismic activity is actually releasing the buildup of pressure in the major fault line beneath the area. Although there is little one can do to prepare for an earthquake, the rule of thumb is “duck and cover.” Duck under a strong table or desk and stay there unless falling debris forces you to move. Cover your head and face to protect them from broken glass and falling debris. The South Carolina Geological Survey (SCGS) is interested in making South Carolinians aware of our seismic past, what causes our earthquakes, what is being done to reduce the losses that will result from future quakes, and what you should do before, during, and after an earthquake. Fires are the fourth largest accidental killer in the United States, behind motor vehicle accidents, falls, and drownings. It is also the disaster that families are mostly likely to experience. Eighty-four percent of house and building fires are accidental, such as those caused by poor electrical wiring or careless behavior. The leading cause of death in a fire is asphyxiation. Fire victims seldom see the flames. Fire consumes the oxygen in the air, thereby increasing the concentration of deadly carbon monoxide in the atmosphere. Inhaling carbon monoxide causes a loss of consciousness or death within minutes. Check smoke detectors and change the batteries at least once a year. Purchase collapsible ladders and practice using them. Install fire extinguishers in your home and teach family members how to use them. Do not overload outlets or extension cords. Only purchase appliances and electrical devices that have a label indicating that they have been inspected by a testing laboratory such as Under Laboratories (UL) or Factory Mutual (FM). Tsunamis is a series of waves that can travel at speeds averaging 450 (and up to 600) miles per hour in the open ocean. As the waves approach the coast, their speed decreases and their amplitude increases. Unusual wave heights have been known to be over 100 feet high. However, waves that are 10 to 20 feet high can be very destructive and cause many deaths or injuries. Tsunamis are most often generated by earthquake-induced movement of the ocean floor. If a major earthquake is felt, a tsunami could reach the beach in a few minutes, even before a warning is issued. Areas at greatest risk are less than 25 feet above sea level and within one mile of the shoreline. Most deaths caused by a tsunami are because of drowning. CodeRED is our emergency notification system used to communicate to residents in emergency situations or critical community alerts such as evacuation notices, boil water notices, tornado warnings, and flash flood notices. CodeRED is typically reserved for short evacuation related messages sent directly to your phone with only pertinent information. Notifications are sent via voice, text, and email. You must be registered to receive. The National Weather Service in Charleston will identify all storms which present a real or potential danger to the area and will alert the Charleston County Emergency Management Division (EMD). The EMD will then alert all local jurisdictions, including the Town of Kiawah Island. Town officials will then alert the Kiawah Island Community Association (KICA), Kiawah Island Golf Resort (KIGR) Kiawah Partners (KP) and all others who will be integral to preserving the safety of island residents and visitors. The Town’s Municipal Emergency Operations Center (MEOC) will be set up at Town Hall to coordinate storm related activities and to answer inquiries from residents, visitors, and commercial interests. It will be staffed until the alert is over or evacuation is underway. Information will be disseminated via our website, email notifications, CodeRED and social media. The Charleston County Emergency Management Division and Town of Kiawah Island operate under alert levels called Operational Conditions (OPCONs), during hurricane season. The OPCONs will be used here to provide a general timetable/framework for you to use in preparing for a natural disaster and evacuation. Possibility of an emergency or disaster situation that may require a partial or full activation of the Charleston County Emergency Operations Center. Disaster or emergency situation likely or imminent. Full or partial activation of the Charleston County Emergency Operations Center; activate Charleston County Emergency Operations Plan. Disaster or emergency situation in effect; maximum preparedness level; full activation of the Charleston County Emergency Operations Center.